My kids love playing with play dough, but for a long time I would make only one color at a time. 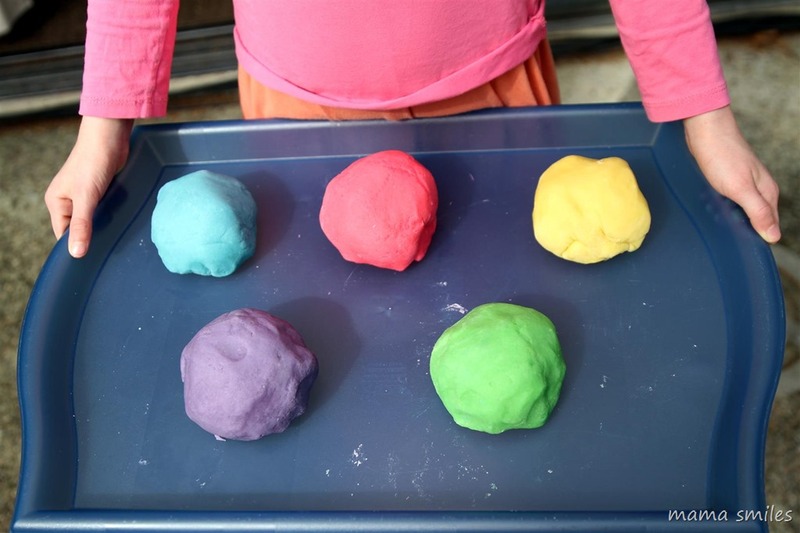 Then I realized that I could easily make several colors of play dough at a time – by making an entire batch of play dough and adding color as you cook a little bit at a time, rather than messily kneading the colors in at the end. This may seem obvious to some of you, but it was a revelation to me, so I thought I would share it here, along with my absolute favorite play dough recipe – with the steps photographed, this time! This recipe does include Amazon affiliate links to a couple of ingredients that we have had a lot of success using. Purchasing anything through these links may earn us a commission – thank you for supporting this blog! Notice how smooth the batter is. If you want nice, smooth play dough, you want your batter to be smooth like cake batter. Since I was making several colors at once, I added the food coloring once the batter was in the pan. 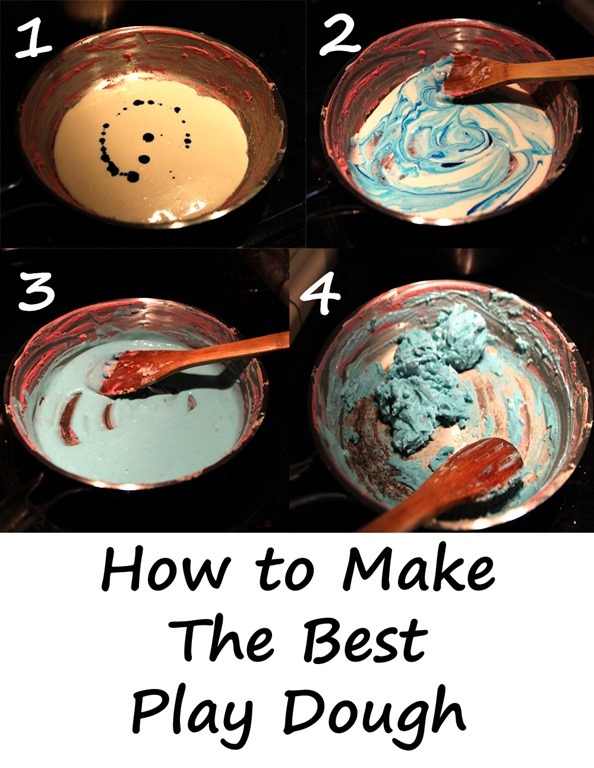 My kids love to watch the food coloring swirl into the batter. Notice that, even though I made pink play dough before this batch, the blue play dough isn’t very affected. Here the food coloring has been fully mixed, but the play dough needs to cook more. You can see here that the play dough is done. You want to pull it off the heat as soon as it looks like this. It will firm up as you knead it. You can also see a few flecks of pink play dough from our previous batch if you look closely here. This is why you want to plan your color order out carefully. A little bit of pink play dough won’t show up in the final blue play dough, but it may have affected green. Wow – those colours Emma is holding are so vibrant! And your pictures make this nearly foolproof. I’m looking forward to trying it! I struggled for ages to get play dough right and was so frustrated with all the play dough posts I read because I just couldn’t get them to work. I was so excited when I finally found a recipe that worked for me – this tutorial would have been so helpful back then. Having the photos as a guide makes a big difference and I’m sure this post is going to help so many people. I really love the vibrant colors you got and the tips about mixing a big batch ahead and planning your colors so you don’t have to clean the pan. So smart and will save me tons of time. Thank you!! My kids loved freshly made playdoh and what a great idea to get several colors at once with no extra pans!!! We will always make a bunch of colors, now that I’ve figured out this trick! Awesome! I love homemade play dough! The gel food coloring always works best for me. This is absolutely THE BEST play dough recipe! I used to make a cooked play dough just like this when my kids were little and it was always the perfect consistency, unlike the store-bought kind. The only difference was that I would add about a tablespoon of flavoring like peppermint, lemon or vanilla. I’d use a different scent for each color. Your post brings back fond memories! Scents are a lot of fun! We actually put vanilla in this batch, and it smelled like cookie dough! I tried first time to make any kind ov dough. First 2 colours turned well. Third was too sticky, tried to fix it but could not. My guess if it was sticky is that it was not cooked long enough. Did you try cooking it longer?